The Amulet series by Kazu Kibuishi is the Hamilton book of the week nominated by Caroline Mickey, the librarian at Alpine Crest Elementary. 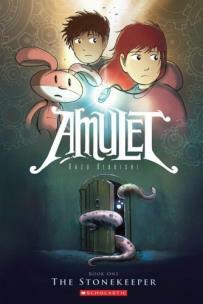 Amulet is a graphic novel series illustrated and written by Kazu Kibuishi and includes eight different books. The series is a collection of adventure, science fiction novels that follows the adventures of Emily, a young girl who discovers a magical amulet in her great-grandfather's house. The first book was published in 2008, and the most recent book was published in 2018. Hamilton Book of the Week seeks to move Hamilton County Schools closer to district goals found in the Future Ready 2023 action plan.